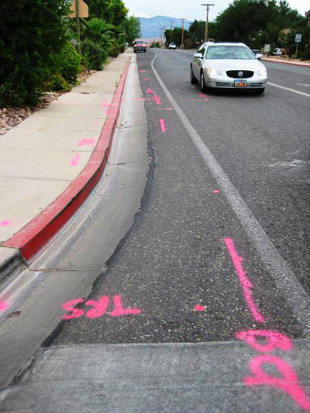 The SUE Solution’s team successfully completed Phase I of the utility research, mapping, and inventory of this transportation project located in Washington, Utah for UDOT Region Four. The general scope of the planned roadway widening reconstruction project includes widening and reconstruction of the SR-212 corridor (Telegraph Street) between 500 West and 300 East. SUE Solution’s Scope of Work includes both Quality Level ‘B’ designating (horizontal) and Quality Level ‘A’ (vertical) locating services. The Phase I designating services were completed in July of 2009 and the Phase II Quality Level ‘A’ testholes are planned to take place later this year (Nov / Dec 2009). Approximately 56,000 feet of Level ‘B’ designated utilities were located, surveyed, and mapped throughout the project corridor. In addition to this number, an additional 6,000 feet of overhead utilities was also mapped (Quality Levels ‘D’ and ‘C’), bringing the total utility footage mapped and located to approximately 62,000 feet (11.7 miles). Utility coordination efforts with Washington City also took place to account for water line locations that will be relocated and/or replaced as part of a separate future City water replacement project. 15 testholes, Quality Level ‘A’ locating, are to be performed throughout the project corridor, gathering crucial utility data such as depth, size, and material once the locations can be determined by UDOT. A comprehensive Phase I final SUE report was produced as a deliverable which contained utility (QL-B) mapping, photographic documentation, informational data sheets for the sewer and storm drain systems, survey data, and Utility Owners existing mapping.